First things first, the down pipe should NOT need bricks to hold it up. 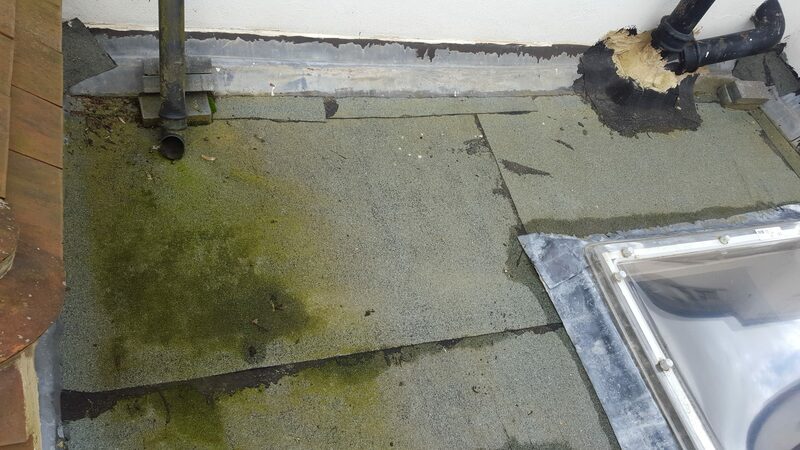 Secondly, the flat roof has been burnt on way too much allowing the tar to bleed all over the roof. Thirdly, the lead flashings should be more than enough but they burnt some felt on because it was leaking, another bodge. Fourthly, the window should have a felt flashing all round to seal it to the roof. Lastly, the lead is the wrong way of doing this majorly. Obviously after looking at this, the previous roofing firm clearly have no pride whatsoever in their roofing services or work. If you have experienced this type of bodged roofing job, then please contact us for more information on how we can rectify the mistakes.